IN TAOISM, THE complementary nature of a pair is expressed through the concept of yin and yang. However, in Taoism, this concept not only defines a relationship of parity but also the relationships of polarity and duality. There is the feminine yin and masculine yang, which are in fact conceptually pairs. However, the yin is also the manifestation of something static whilst the yang is dynamic, so at the same time they are an expression of polarity or duality depending on the contexto. This is, static and dynamic are dual when the same thing can be one or the other depending on the point of view. Because nothing in at rest in the Universe, if something appears static to us is because we are moving along with it. And they are polar when they alternate. For example, our body is at rest at night (static) and in motion during the day (dynamic). On the other hand, parity means that two complementary elements combine to produce a third element made up of both. From the parity between man and woman, the third element produced is their child, who with their lips utters that first human sound, to call for their mother and ask for her milk. Once learnt, the sound previously mentioned will be followed by a second, which is usually papa (Spanish), tata (Quechua), dad (English), aba (Arabic) or a similar sound which the child makes to call for their father. In Andean cosmology, the relationship of complementary parity is called yanantin and that of alternating polarity is called kuti; whilst we saw an expression of duality in the word pacha, which was both time and space. These relationships also appear in the Taoist Tajitsu but expressed the three in the concepts of yin and yang. A more complex use of both principles is found in the I-Ching. Here the yin (⚋) and yang (‒) are combined in groups of three to obtain eight trigrams, with Heaven (☰) and Earth (☷) being the two trigrams at each extreme. Heaven is all yang and Earth is all yin. The eight trigrams are then combined in pairs to obtain 64 hexagrams. 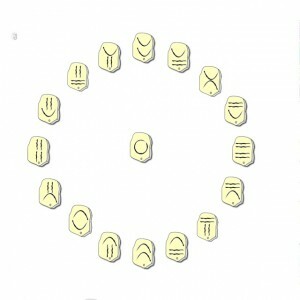 The Heaven trigram (☰) represents Pachatata and the Earth trigram (☷) Pachamama. So far we have looked at the similarities but there is also a great difference. Perhaps this is due to the fact that the two cultures emerged on opposite sides of the World. This was mentioned in Part I of this article, where the Andean Chakrana and the Tantric Sri Yantra were compared. 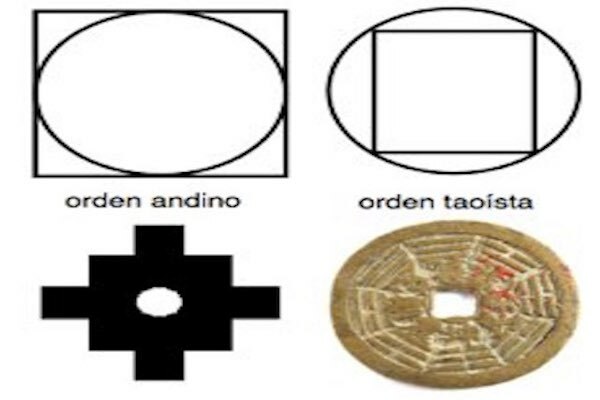 We see that in Andean cosmology, the Earth, or Pachamama, is represented by a circle whereas in Ancient Chinese cosmology it is a square. 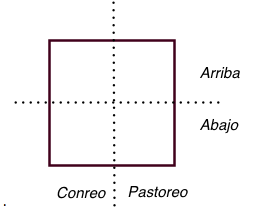 On the other hand, in Andean cosmology, Pachatata is a square whilst the Chinese Heaven is always round. Hence the famous phrase: ‘*Tian Yuan Di Fang*’, which describes the essence of Chinese cosmology and means ‘Round Heaven and Square Earth’. On the left side we see the Incan pukina, which shows the time-flow between two alternating polar elements (kuti), such as the day and night. We can observe a curve emanating from the centre (Earth) and how this merges into a square (Heaven) as it nears the periphery. This symbol is found on metal works from the Pukina people, which was part of the ancient Inca state. On the right side we can see the Tajitsu, or Tao, with the eight trigrams that surround and adorn it. The symbol is circular, in order to represent the cosmic order of the alternating polarity. This is done in such a way that when one element is expressed fully, it retains the seed of the opposing element, which sprouts as a tail until reaching its plenitude. ANDEAN LOGIC FOLLOWS a different path to Taoism when combining pairs. Instead of combining two principles that convey parity, duality as well as polarity, as with the yin and yang, what it tends to do is combine two pairs, or one pair and two opposites (polar), in order to attain four elements. 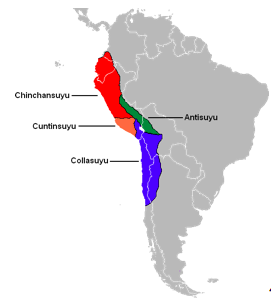 For example, during the Inca State, the local communities (ayllus) were divided into upper and lower areas. In fact, they still are. Since the majority of villages were located on the mountainside, it was easy to carry out such division. However, the principal reason for this was not geographical and neither did it apply viva video for pc only to villages. Cusco itself, the capital, was made up of Hanan Qosqo (Upper Cusco) and Hurin Qosquo (Lower Cusco). The distinction was made for socio-political rather than geographical reasons. The division was not created in order to separate. Those who believe this do not understand the real meaning of yanantin. Instead, it was created in order to unify. The community as a whole could only work as a union of two complementary parts (yanantin), thus the need for division in the first place. In addition to the above, we can find another example of equal divisions. We refer to the distinction between land used for grazing and arable land set aside for agriculture. These two concepts have a different relationship than that mentioned above, but still have equal standing. It is equal in that foodstuff, as the third element, is produced by combining both types of land. The most fertile land was set aside for agriculture, and the barren areas used for grazing. Thus, by combining both pairs we obtain four permutations. Accordingly, all the land adjacent to a community was divided up into four sections. This made sense, since in tropical-latitude mountain ranges, the lands below are usually warmer and more suitable for cultivating crops such as corn, whereas the upper lands are ideal for potato crops. Another example, this time combining two pairs in a relationship of equality, is found in the nuclear family. In Andean culture, a person is not considered an adult until they are married, in other words until they have become part of a pair. Then sons and daughters are borne. In many situations, the former find themselves in a relationship of equality (masintin) with their father, so if for example he cannot make some meeting he will send his son, who will in effect carry out the duties of his father. The same thing occurs between the daughter and mother. Thus, by combining two pairs, made up of mother-father and daughters-sons, with a relationship of equality between daughter=mother and son=father whenever required, the family becomes an expression of a whole. Consequently, we can say that the Incas perceived reality in terms of fours. That is to say, their perception was quaternary and with it they attempted to represent the order they perceived in Heaven (square) on Earth (round). In contrast, the Taoist cosmic order was based on a square Earth surrounded by a round Heaven. Despite the differences observed between the two cosmologies, they do possess an essential element in common: both follow the natural series of octaves. That is to say, they invariably use a number of permutations that vibrate to the same note as the Unity but resonating at a different octave. We should not forget that, musically, a note that vibrates an octave higher has twice the frequency. For example, according to the International Organization for Standardization (ISO), an A on a piano should be tuned to the standard pitch of 440 Hz. The same note an octave higher will vibrate at 880 Hz, and at an octave below at 220 Hz. From this we can see the natural octave series is: 1, 2, 4, 8, 16, 32, 64, 128, 256, 512, 1024, and so forth. 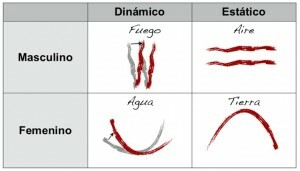 We can observe this series not only in Taoist and Andean cosmologies, but also in computer science. For example, one bit possesses 2 states: switched off (0) or switched on (1). 1 byte might have 8, 16, 32 or 64 bits, depending on the type of computer. One K (kilobyte) has 1024 bytes, etc. The natural octave series therefore makes a binomial distribution. In biology the same series is in our DNA, where two organic compounds, called ‘purine’ and ‘pyrimidine’, unite to produce four nitrogenous bases: adenine (A), thymine (T), cytosine © and guanine (G). The four nitrogenous bases then combine in groups of three to produce 64 codons. 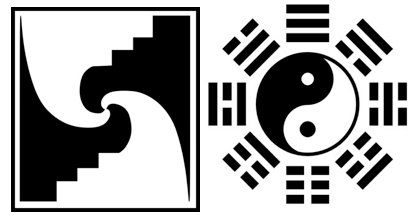 Regarding Taoism, we can see a similar sequence in the I-Ching, with its* yin* and yang that represent elements in parity, polarity and duality. These combine to form eight trigrams which then re-combine, in pairs this time, to form 64 hexagrams. With respect to Andean cosmology, we can see this in the equality from which everything begins, from how two pairs make up a cuartet (Tawa) representing the cosmic order, and from how this cuartet is then elevated to a cube to obtain 16 permutations. This is also observed, for example, in the 16 paths that lead to Machu Picchu, with 4 proceeding from each region (suyu). It is also observed in the Lake Titicaca area, where groups of 16 people commonly meet to debate issues relating to the community. It follows that the Khuyas of the Mastay form combinations in a very similar fashion. With these stones, two pair elements (male-female) and two polar elements (static-dynamic) combine to produce the four elements of air, fire, water and earth. <li id="fn:fn2">Map drawn up by Wikimedia Commons user: EuroHistoryTeacher and distributed under license Creative Commons -. Attribution, Non-Commercial and Share Alike.